Today was Disneyland’s Greatest Hits day. Everyone got to choose their favorite rides and we did them all again. Zoë was denied a 7th ride on it’s a small world, since they’ve shut it down for a few weeks to put the Christmas version of the ride together. And we ended up missing Splash Mountain altogether this trip. It has been closed for renovations the whole time we’ve been here, but it was supposed to reopen today. Unfortunately, they didn’t finish the renovations in time, so it looks like we’ve missed it completely. Once again, Zoë shocked everyone by suddenly deciding to go on The Haunted Mansion and, once again, ended up loving it. But the highlight of our day was finally meeting Jasmine, from Disney’s Aladdin. 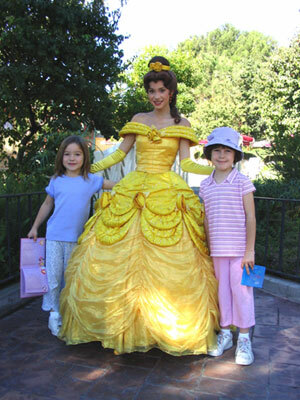 Jasmine is Emma’s favorite Disney princess, and we were starting to worry that we’d never have a chance to meet her. We’d already met Zoë’s favorite, Belle, on Tuesday. But late in the afternoon, as we were coming back from Emma’s second ride on Indiana Jones and the Temple of the Forbidden Eye, there she was. 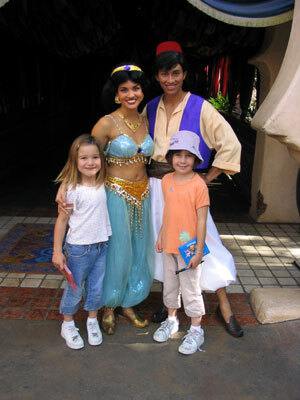 And, yes, Aladdin was wearing more makeup than Jasmine…and, yes, it was a little disconcerting.